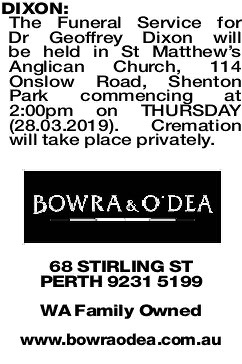 The Funeral Service for Dr Geoffrey Dixon will be held in St Matthew's Anglican Church, 114 Onslow Road, Shenton Park commencing at 2:00pm on THURSDAY (28.03.2019). Cremation will take place privately. 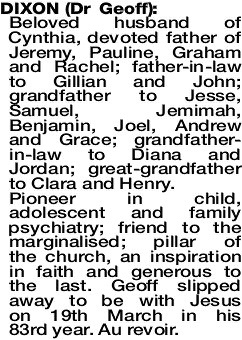 Beloved husband of Cynthia, devoted father of Jeremy, Pauline, Graham and Rachel; father-in-law to Gillian and John; grandfather to Jesse, Samuel, Jemimah, Benjamin, Joel, Andrew and Grace; grandfather- in-law to Diana and Jordan; great-grandfather to Clara and Henry. Pioneer in child, adolescent and family psychiatry; friend to the marginalised; pillar of the church, an inspiration in faith and generous to the last. Geoff slipped away to be with Jesus on 19th March in his 83rd year. Au revoir. 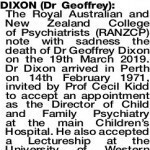 The Royal Australian and New Zealand College of Psychiatrists (RANZCP) note with sadness the death of Dr Geoffrey Dixon on the 19th March 2019. 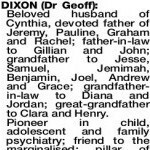 Dr Dixon arrived in Perth on 14th February 1971, invited by Prof Cecil Kidd to accept an appointment as the Director of Child and Family Psychiatry at the main Children's Hospital. He also accepted a Lectureship at the University of Western Australia, in the Psychiatry Department at it's establishment by Professor Cecil Kidd. 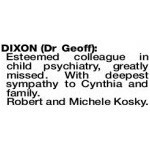 For much of his career Dr Dixon taught child psychiatry to undergraduates and consulted at Princess Margaret Hospital. He was a quiet, steady man, sustained by his faith and his family. The WA Branch Committee, on behalf of all WA members, extend their deepest condolences to the family and friends of Dr Dixon. Esteemed colleague in child psychiatry, greatly missed. With deepest sympathy to Cynthia and family.